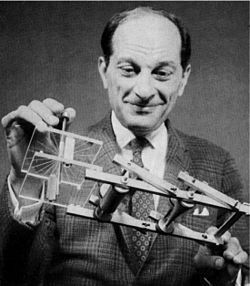 Stanislaw Ulam was a Polish-American mathematician whose work spanned many areas of both continuous and discrete mathematics. He did pioneering research in chaos theory and Monte Carlo algorithms, and also invented the concept of a measurable cardinal in set theory. His essential modification of Edward Teller’s original H-bomb design is used by nearly all the world’s thermonuclear weapons, while he co-originated the Graph Reconstruction conjecture. His name is also associated with the equally notorious 3n+1 conjecture. Thus he was involved in some strange corners of math. Today Ken and I want to talk about some strange facts observed by Ulam and others that we did not know or fully appreciate. Ulam’s mind is a repository of thousands of stories, tales, jokes, epigrams, remarks, puzzles, tongue-twisters, footnotes, conclusions, slogans, formulas, diagrams, quotations, limericks, summaries, quips, epitaphs, and headlines. [H]e simply pulls out of his mind the fifty-odd relevant items, and presents them in linear succession. A second-order memory prevents him from repeating himself too often before the same public. There is another reason for discussing this today. Class is underway and we both are trying to get things going and we wanted to start a discussion out. We are working on a longer, more technical one, about—“that would be telling”—so let us do this now. Note: fifty extra points for where that phrase comes from—with a search. We can begin with any number in place of —thus if we begin with this is the same as adding to all the numbers. One basic fact is that if we take any ray from the origin that goes through the center of another cell, then the th number skewered along that ray is given by a quadratic function of . For instance, the horizontal ray is given by , the northeast ray by , and the ray of north-northeast knight’s moves by . Similar rays originating from other squares also have quadratic formulas. If we sequence the numbers that fall on full lines rather than rays, however, we do not get a quadratic function. For instance, the numbers that fall on the horizontal axis in order are They do not fit any polynomial formula at all—one has to do integer division by 2 (throwing away remainders) to get a formula. Indeed, this sequence doesn’t have an entry in OEIS, the Online Encyclopedia of Integer Sequences. [Update: see this.] Likewise, the northwest-southeast line has all the odd squares but no nice formula. Nor does the line of knight moves . But there is a singular exception. The southwest-northeast diagonal gives , which has the formula . Why does this happen? Each of these numbers is prime. The sequence is all prime until you substitute to get , which is . Of course, this is the famous prime-generating formula of Leonhard Euler. The extreme good fortune of this formula has been “explained” using class-number theory, but we did not notice the strange diagonal exception until writing this post. The story goes that Ulam became bored during a long lecture in 1963, doodled a number spiral like the one pictured above, and circled the primes to see what the plot would look like. He was struck by how many substantially long diagonal segments of primes there were, going northwest as well as northeast. Of course, gives Euler’s sequence as a huge diagonal swath through the origin, but as Wikipedia’s article notes, the effects of Euler’s formula show up on other diagonals with larger values of even with . Despite connections noted in both sources to earlier theorems and conjectures about quadratic polynomials, it is still considered that this affinity for diagonals has not been sufficiently “explained.” The larger picture that strikes us the most is given immediately on the front page of Rudd’s site. Many unsolved problems in number theory, including the Riemann Hypothesis itself, involve the idea of how much the primes behave like a “random” sequence. This supports belief in the Goldbach Conjecture and the Twin Primes Conjecture, with probabilistic reasoning like Freeman Dyson’s in our previous post. If we randomly choose odd numbers with the same density as the primes, then a spiral plot of them looks like “white noise”—nothing like Ulam’s spiral. But if we note that odd numbers of the form cannot be prime, and exclude them, then the randomly-generated plots of the same density begin to look streakier. Excluding other congruences, and other exclusions noted on the site, makes the pictures look closer and closer to Ulam’s. See this for some related facts. This one comes from here. Let’s say you invest $10 in the market and you make a 10 percent return. You now have $11. Now, let’s say you lose 10 percent. Out of $11, that’s $1.10 leaving you with $9.90 which means you are down ten cents on the deal. You gained the same percentage as you lost yet you came out behind. Well, you might speculate it has to do with the order of the transaction. After all, the 10 percent you lost was bigger than the 10 percent you gained because you were already up on the deal. That means reversing the order should have the opposite effect. Right? Start with $10. Now lose 10 percent first. You have nine dollars. Then gain ten percent. That’s 90 cents leaving you with…$9.90. Yep. You lost money again. Strange as it may seem, a gain and a loss of the exact same percentage will always leave you with less cash – regardless of the order in which they occur. I wonder if we can use this simple but strange fact in some algorithm analysis? Suppose you take the average of the numbers of friends each of your friends has, and compare that with your own number of friends. Chances are will be significantly higher than . This leaves a lot of people wondering, why are my friends more popular, more vivacious, more successful, than I am? This phenomenon has been well documented on Facebook and other contexts where “friend” is rigorously quantified. It is ascribed to a 1991 paper (titled as above) by the sociologist Scott Feld, but Ken and I would be surprised if it hadn’t already been noted in connection with the collaboration graph of mathematicians. Ken recalls a talk given by Donald Knuth on properties of this graph 30 years ago at Oxford, a few years after a paper by Tom Odda that also cites studies by Ron Graham and others, but has no recollection of this being mentioned. It is easy to explain in those terms. Think of Paul Erdős, who famously had hundreds of collaborators. Many people were touched by him. But each of them had averages that included Erdős, which alone was probably enough to boost over their own valence in the graph. More generally, let us assign to every node a “collaborativeness potential” , and consider various ways to generate random graphs in which the probability of an edge depends on and . For instance, every node might pick a set of 100 potential co-authors at random, and the edge is placed with probability . Potential connections within will have a higher chance of succeeding with those having , who in turn will expect to have more successful connections. The result is shown with more rigor by Steven Strogatz in this New York Times column. Still, we find it strange as a raw fact of life. What is your favorite strange fact? maybe even more interesting is that if we mark the even ones in pascal’s triangle, we get sierpinski’s sieve. Regarding the Percentages one, Nayuki  has noted that it can be nice to use log scales; perhaps “nepers”  or “log points” (1 neper = 100 log points), then in the case you have here, we get first a gain of ~9.5 log points, then a loss of ~10.5 log points, leaving the net gain as -1 log points, and the same result considering the loss first. To me, the strangest mathematical fact is Euclid’s proof that there are an infinite number of primes. That was the first number theory proof I had ever seen and was very surprised that it was possible to figure this out. See what John Baez wrote http://math.ucr.edu/home/baez/numbers/24.pdf about this equation. Since 1.1 * 0.9 = 0.9 * 1.1; and in general (1 + x) * (1 – x) = 1 – x^2, which for |x| < 1 gives 1-x^2 < 1; I'm not sure just how unusual this fact is to apply to some algorithm analysis. have long thought that maybe primes were mankinds 1st encounter with mathematical fractals. however there is still not a definitive mathematical definition. but the case is much stronger. it seems while utterly fundamental they are still poorly understood in many ways. Let c(n) be the number of steps to convert n to 1 using the Collatz rules. I just noticed that c(5) = 5. Are there any other number n such that c(n) = n? Or is there a simple explanation as to why only 5? I am just a little bit curious about this and I am thinking it must have some relation with power of 2. I don’t know if there are other cases, but they are surely much harder to find, simply because 5 is the only solution to the equation 3x+1 = 2 ^(x-1). Other potential cases are therefore the outcome of the Collatz chaos. The independence of the Continuum Hypothesis seems quite puzzling to me. Congratulations for the Knuth prize. The horizontal axis sequence not in the OEIS is there in two parts: Starting with 1, the east path is A054552 and the west path, A054567. Also, as Jerry Friedman has pointed out in alt.usage.english, “that would be telling” goes back to at least 1830 Ireland. Indeed, many other “parts” (rays) are there; the point is that the combined sequence is not. Ah! It belatedly occurred to me to subtract 1 from that sequence, using the 0-based spiral. This is A035608, which occurs in expanding the generating function . It goes 0, 1, 5, 10, 18, 27, 39, 52, 68, 85,… and has formula . 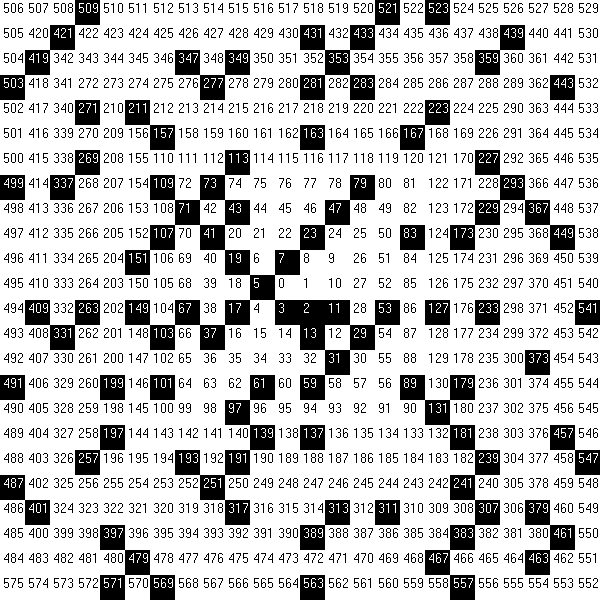 The connection to the Ulam spiral is also noted there, by Emilio Apricena in 2009. This “restores the honor of the OEIS” as I see Peter Luschny desired :-). Now, let A = sqrt(2)^sqrt(2) and B = sqrt(2). If A is irrational, then A and B are the two irrationals and the proposition is proven. If, however, A is rational, then A’ = B’ = sqrt(2) are such that A’ ^ B’ = A = rational, and the proposition is again proven, since sqrt(2) is irrational. Consider a rectangular triangle of hypotenuse c (opposite to vertex C), legs a (opposite to vertex A) and b (opposite to vertex B), and angle alpha between a and c, at vertex B. This triangle is uniquely determined by c and alpha alone. where f(alpha) is some dimensionless function of the dimensionless angle alpha. Thus, since Area(ABC) = Area(BCD) + Area(ACD), and f(alpha) cannot be zero for a non-degenerate triangle, we find that c^2 = a^2 + b^2. Because 4 is doubly even, 8 is triply even, 16 is quadruply even, etc. The fact that almost all binomial coefficients are even is a consequence of the Lucas’ theorem. I spent a bit of time musing about Ulams diagonal primes while stuck in traffic today, and in the end I’m not convinced there’s anything special about them. Even numbers occupy half the plane in chess-board fashion, so the only patterns you can ever expect to find in the first place are diagonal lines. So how common are those ? If I run a couple of trivial simulations where I don’t plot in the prime numbers, but just random odd numbers with a frequency distribution roughly the same as prime numbers I get … Diagonal lines. I tried to do some basic statistics on the count, direction and lengths of diagonal runs, but found nothing that would tell prime numbers from random numbers apart. So no, I don’t buy it: It’s just our brains finding patterns, like it finds faces on Mars and Virgins on toast. We addressed this in the post by linking to Helgi Rudd’s plots of random odd numbers, devoid of “diagonal Martian canals”, then random plots excluding other congruences. Take a look at his site. Ulam wasn’t blowing smoke, and Scientific American even put this on its cover in March 1964. Speaking of math dis-eases, I had a bad case of Ulam’s Reconstruction Syndrome (URC) all through the 80s. It’s a lot like malaria, with seasonal flare-ups every spring. As I recall, the first time I saw computer generated fractals was in 1987. I thought there must be some complicated program to generate such things. Then the person who wrote the program showed me that the program was quite short. I guess this was the strangest mathematical fact I’ve ever seen. Simple programs can generate complicated output. Not true. It fails for the prime numbers 2 and 3. It is obvious for all other primes. Strange is the world of Mathematics !! !